Rescued, Eliot Schrefer’s third entry in his anticipated quartet of ape novels published by Scholastic, represents a departure in many ways from the first two books in the series. Endangered and Threatened both took place in Africa and featured early teen narrators fighting to survive alongside bonobos and chimpanzees. 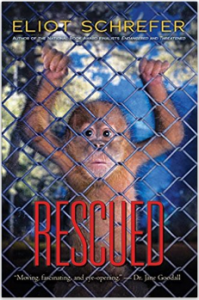 In Rescued, Schrefer brings his series to the United States and introduces us to John, a sixteen-year-old football player who is the product of a broken home, and Raja, the orangutan his father smuggled into the country to become the family’s pet. We first meet these two as they are separated, Raja banished to the backyard and a younger John bedridden with a pneumonia that may have been contracted from Raja. They communicate by a homemade sign language through John’s bedroom window and eventually Raja becomes desperate to reunite, breaking the window frame and ultimately wounding John. Fast forward four years and John is living across the country with his mother while Raja has stayed behind with John’s unemployed father. Unable to keep Raja or his foreclosed house, John’s father contacts a place called Friendly Land—a tourist attraction with rides and exotic animals—that John begins to suspect will not provide a good home for Raja. He flies across the country to say goodbye to his childhood best friend, but as the reality of what’s happening sinks in, John makes the impulsive decision to rescue Raja and try to deliver him to a better life. The first two books in this series felt like twins. Their adolescent narrators were thrown into extraordinary, life threatening situations where humans were the enemy and the animal world was their only chance for survival. This book feels like the older sibling to the first two, still family, but navigating on an entirely different plane of existence. We are in the U.S. now, where no apes live free, and our late-teen narrator must deal with the less exciting adult world of animal rights issues like property laws, court cases, and political bureaucracy. It probably reflects poorly on my worldview that I was more skeptical about a senator amending an animal transfer order than I was about a boy living alone in the jungle with a troop of chimpanzees. Schrefer embraces the adult tone in Rescued by spotlighting many animal rights issues throughout the narrative and he’s not shy about making his point. He dives into the ethics and politics of the palm oil plantations that are destroying orangutan habitat. Through John’s father, he shows how orangutans are orphaned or killed and as Raja ages, we understand all too clearly what happens to exotic pets when they’ve outgrown their cute infant phase. Schrefer even takes time to call out Air France as the only commercial airline still willing to transport kidnapped animals used in research facilities in the United States. In all three of his ape novels Schrefer does an outstanding job creating vibrant, true-to-life animal characters and passing a wealth of knowledge about their species to his audience. The series is worth reading for the education alone, but the fast-paced plots and sympathetic human characters will keep you spellbound until the last page. A solid entry in Schrefer’s ape quartet as we wait for the final book and think about the gorillas to come. Have you written a book or article that celebrates mountains?